Briena Sash is a professional photographer, award-winning artist, and the creator of Wellness Stock Shop – “the world’s most soulful source for wellness imagery”. She seeks to promote natural, holistic living by making her beautiful, soothing imagery accessible to wellness business owners and bloggers around the world. You’ll probably find her frequenting one of Portland, Oregon’s many fine coffee roasters, ice creameries or wandering in the woods. Tell us about your business – what’s your mission; your soul’s purpose and why you created your business or service? Trying to stand out in the crowded market … and to be taken seriously as a professional and a credible “alternative” to common western medicine is hard. That’s why I created Wellness Stock Shop, “the world’s most soulful source for wellness imagery”. At my deepest core, I stand for our earth and for living in ways that foster natural wellness and sustainability. I desired a way to express that. I wanted to use my skill as a photographer as a tool to support a mission I believe in and value. Tell us about your journey and your story…describe your business and any major life events….what got you to this point today? It’s common to get funneled into portraiture as a photographer. And so there I was – photographing magazine-style portraiture and headshots. It happened rather abruptly one day in October that I realized – portraiture was completely out of alignment with what I wanted to be promoting, doing, and creating in my life. In my free time, when I wasn’t working on my photography business, I was making my own non-toxic cleaning products and treating friends to “spa” days with essential oils – promoting natural, sustainable, non-toxic living. I was tempted to switch gears completely and enroll in the health coach program at Institute for Integrative Nutrition. I knew I wanted to work in the world of natural wellness. In April 2015 I was flown down to San Francisco to work on the “Ban the (plastic micro) Bead” campaign for the Story of Stuff Project. That was so much closer to the mission I wanted to pursue. But I realized that instead of working on an environmental campaign, which speaks mainly to people interested in and open to environmental activism, I wanted to work with purpose in a way that more people could relate to – that would encourage natural, non-toxic lifestyle and would integrate more gently into the lives of all people. At the time, I was working with several photography and branding clients in the wellness industry at the time – health coaches, massage therapists, organic skin care boutiques – and became aware of a major lack of decent stock photography to support holistic wellness and natural living. That’s when I realized that – rather than becoming a health coach myself – my strengths and skills as a photographer could make a stronger impact by serving the already-existing industry with beautiful, accessible professional imagery. Big pharma has the income to drop on creating the professional look that naturally fosters trust and credibility among communities. Small independent practitioners don’t share that corporate budget. I wanted to create a solution to support the small people. And that was it. I quit my portraiture business on that day and poured my focus into building an accessible professional photography source for holistic practitioners. That’s when I launched Wellness Stock Shop. Have you ever heard of a stock photo site specific to natural wellness? No. That’s because it never existed before Wellness Stock Shop. I decided to carve out my own niche, marrying my diverse photography skills with my passion for natural, sustainable living to launch the first-ever (to my knowledge) stock photo site for natural wellness. I was tired of following the “typical” path of the photographer. I wanted to serve a deeper purpose and make a difference in our world. And I wanted to serve other purpose-driven women who share my mission. I wanted to provide high quality imagery that people instantly connect with… not the stale, lifeless stuff that’s so stereotypically “stocky”. I wanted my imagery to be accessible to small businesses who lack corporate budget. I wanted my clients to be able to access enough imagery to cover all their daily needs on social media and all marketing platforms, year-round. Not just one photo here and there when the budget allows. I wanted the imagery to be cohesive, on-theme, and easily find-able so my visitors wouldn’t have to sift through thousands of unrelated images, all by different photographers with different styles, to find the handful of images that relate AND look good together. I wanted the imagery to come with easy-to-understand usage rights that were the same simple, flexible terms across the board, rather than custom per photo. Honestly, things have happened pretty rapidly. It really shows the power of imagery, as the stock photo site has been my personal best business tool for attracting clients and growing my business. I honestly tap into WSS every day (I can’t help by love the fact that I created a business tool that I get to use myself!). I receive random, spontaneous love letters from admirers worldwide simply because they love my imagery. My Instagram following grew by 10,000 followers in just 8 months using WSS imagery alone (many of whom have become customers). And in less than a year I’m serving clients in over 10 countries worldwide, from Canada and Mexico to Australia, New Zealand and countries in Africa and Europe. I’m a HUGE traveler and lover of diversity, so I love looking to see which country every new client is from and last winter sent New Year’s cards to each one of my members. Tell us about the start-up scares: Was there a moment where you ever seriously contemplated quitting? There’s never been a doubt in my mind that Wellness Stock Shop would be a success. I’m super passionate about it. But it’s extra tough to keep your head above water when you’re putting in endless hours of work and not yet bringing in comparable profit. It takes a TON of work and time to get a business off the ground. And it’s hard to push through when people around you express their doubts. Most people I know didn’t understand my vision. Even though they didn’t verbally tell me I was crazy, their doubtful facial expressions and verbal tone sent clear messages. I’m so grateful to my dad. He was actually the first person to inspire the idea of a stock photo site and has been my biggest cheerleader and source of support through thick and thin. It’s pretty special to have a dad like him and I never ever take him for granted. I wouldn’t be where I’m at today without him. Always. I’m always making mistakes and failing at things. This is all new to me. I didn’t head into this venture knowing what to do, so it’s all based on trial and error. I make massive efforts to listen to my community and deliver on what they need. The entire purpose of Wellness Stock Shop is to support them, so their feedback is so valuable to me! I think my biggest mistake has been trying to do everything alone. As solopreneurs who launch our businesses with small budgets, it’s easy to try to cut corners and do things ourselves. But that often produces mediocre results that take us WAY longer to produce and ultimately hurt us by damaging our trust and credibility. Actually, using DIY photography or piecing together free stock photos is a great example. It takes way longer to sift through and pull together the imagery and results in a collaged, amateur brand that sends red lights to potential prospects. People want to know they can trust us. That we’re professional and credible. If they detect amateur they run the other way. I created Wellness Stock Shop to make it easy for wellness business owners to create a professional visual presence. And I personally tap into services from other professionals to help me with the things I’m not good at. There are so many amazing resources out there now that are easy to tap into and well worth the investment for our businesses. Following my heart. For years I followed the path that I see other photographers follow. The “easy” path that turned out to actually be the hardest experience of my business life. Once I sat down and hashed out things with my heart and where it wanted to lead me, things have opened up and fallen into place. And I’m so much happier and in alignment with my passion. What’s the best advice YOU’VE ever received about pursuing your vision? Actually, there are two that stood out to me over the past year. The first was from Lewis Howes. He basically said that no one ever achieved success on their own. That’s what made me realize I was going it wrong as a solopreneur and needed to tap into the services/products of other experts. The second was from Marie Forleo. She said that it’s YOUR job to get your products and services in front of the people who could benefit most from them. That blew my mind because my entire time as an entrepreneur until that moment was spent sitting, waiting to be discovered and feeling hurt that it never happened. Suddenly things became blatantly clear when I realized how grateful I was to the businesses who showed up for me and made it super easy to find/access their products/services, which answered my needs. I decided I needed to do that for the people who badly need a source for beautiful, accessible professional photography to strengthen and grow their wellness businesses. Yes. It’s made me more confident. It’s made me reflect on the timid “artist” complex that so many people suffer from. That I have suffered from in the past. Playing small keeps you small and keeps the gifts you have to share from the people who can benefit from them most. I’ve realized that the more you have, the more you can give. And I LOVE giving. My business is still “new”, so I still work from sun up to sun down. But I LOVE it and never want to go to sleep because I’m so excited to wake up and get back to work. Lately, I’ve been infusing more balance into my routine. I wake up, enjoy some bulletproof coffee, go for a walk, work for a few hours at my computer, do some yoga, make a shake which inspires me to create some photos of it, then go on a healthy food photo tangent, round back into my computer work, and make some dinner. It’s pretty lovely. Definitely Michael Jackson and David Bowie. 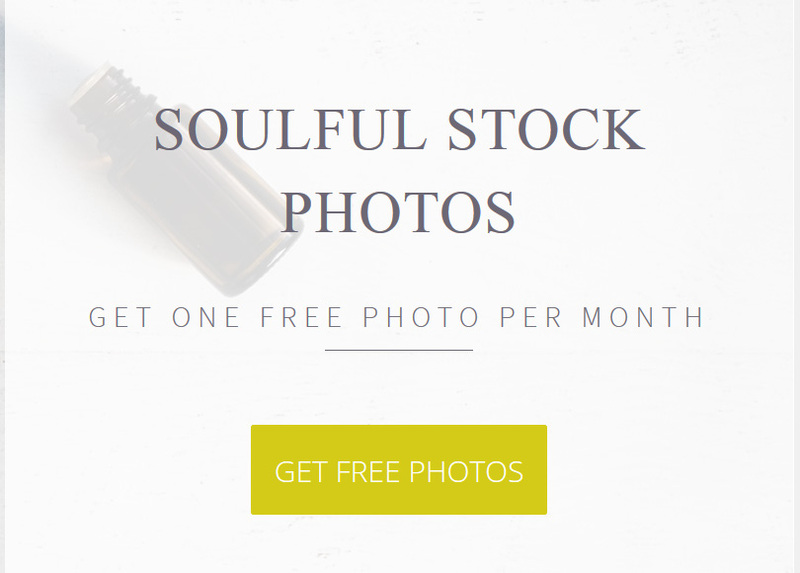 You can visit Briena’s site and download a free sample of wellness themed photos at wellnessstockshop.com and join her Facebook Group – Wellness Brand Collective – for more tips on photography, branding and social media.